This home, created for a family with children and located in a private housing development next to a golf course, was born from one clear concept: year-round outdoor living. “The idea was to create a large garden with wide, covered spaces where one could live outside, day or night, every day of the year. It was about capturing the sunset with friends and family, and relaxing with some tapas and Spanish wines,” explains Gus Wüstemann, creator of the project. 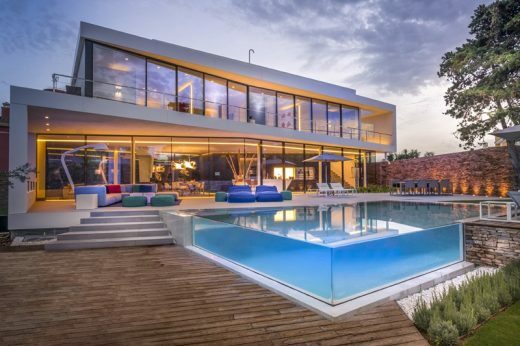 As a result, the home centres on a large atrium and is constructed above an aromatic Andalusian garden featuring an inviting swimming pool. Previously, a small detached family home stood on this plot, customary for the area, with a beautiful garden with well­-cared-for plants and trees. The new house has been designed to cater for a large family as well as providing guest rooms for friends. Designing fully livable outdoor spaces was a major challenge. “We needed to create the necessary intimacy with the surrounding buildings, but also design an environment where one could live outside without feeling exposed. So the concept behind the project was that the entire property would be a garden surrounded by a border, filled with content,” Wüstemann says. The majority of family and social life takes place within this space, from lounging and chilling-­out to barbecuing. The building structure is marked by straight lines and generous spaces. These large internal volumes also act as “natural lamps”, carrying light to different areas throughout the day, following the movements of the sun. The pristine white facades, along with the bright white walls and floors, also reflect the light and create a tranquil feeling. The home’s perimeter wall connects seamlessly with the central space on the first floor, and surrounds the garden living room. 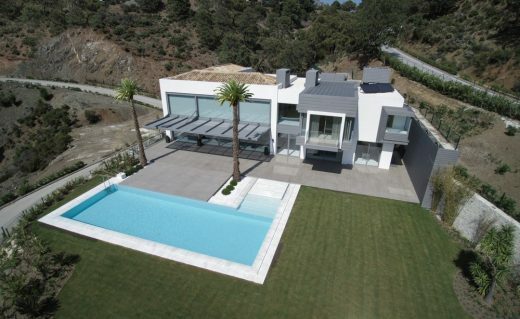 The exterior is characterised by white plaster coupled with the typical blue Andalusian sky. “There are no windows or other openings leading to the exterior or the public area. 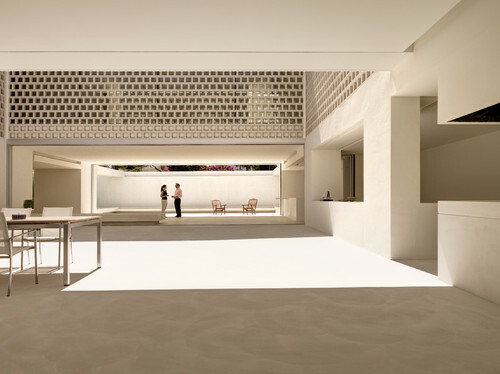 The home looks like a white cube, similar to the Andalusian Arab patio homes. The plants are the only indicator of life inside, when viewed from the outside. 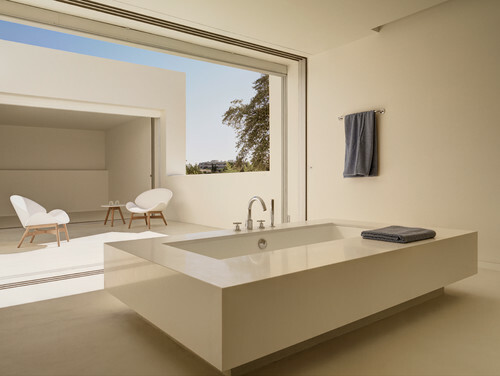 Everything has a white finish, creating an endless landscape,” Wüstemann says. 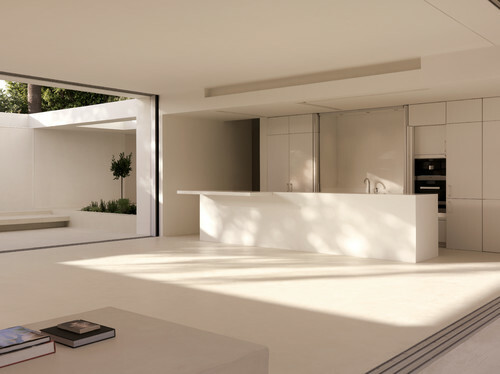 The kitchen, located on the first floor, is camouflaged so it blends seamlessly into the home. The wall units have a crisp white finish and hide the kitchen appliances and functional areas. The concept of this domestic interior space, which can be completely opened up to the outside, follows neat and strict architectural guidelines. Having a parallel layout and appliances hidden behind closed doors, simplicity is synonymous here with a minimalist design. Integrated coffee-maker; steam oven; hotplate; dishwasher; oven, all Miele. Fridge; freezer; wine cabinet, all Liebherr. Induction hob, Foster. Extractor hood (hidden in the ceiling), Elica. Krion worktop, Porcelanosa. Sink; tap, both Frecan. The bedrooms, family room and yoga terrace are located on the first floor. 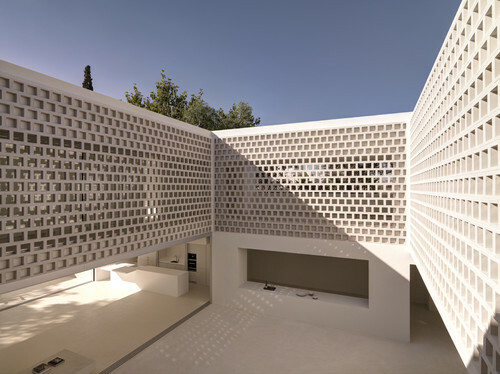 The perforated stone facade filters light into the rooms and corridors in the private areas. Each bedroom has a private bathroom and an adjoining patio. 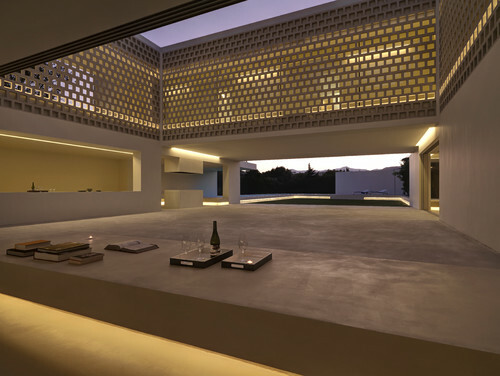 This honeycomb formation surrounding the patio creates an interesting interplay between light and shadow inside the home. The master bedroom, bathroom and patio create a peaceful, open space in which the couple can rest, sleep and shower without being seen from the outside. The benches, both indoors and out, are made of plastered brick with a microcement finish. The same flooring has been used throughout, both indoors and out, maintaining a sense of unity and continuity. 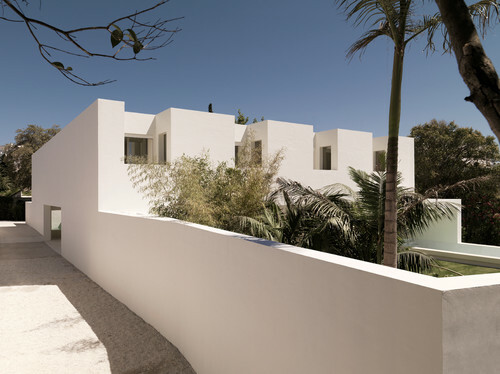 This image illustrates the complete unity between the rooms and terraces, in line with the main philosophy behind the design. The freestanding bath marks the transition between the suite and the terrace. Its elevated design makes it appear as though it’s floating on air. Keops bath (without water jets), Royo Group. Taps, Roca. In the master bathroom, the seamless walk-in shower with frameless glass screen continues the minimalist theme. Euphoria shower system, Grohe. Rain-effect showerhead, Tres. Loop & Friends basin, Villeroy & Boch. Taps, Roca. Countertops, Silestone. 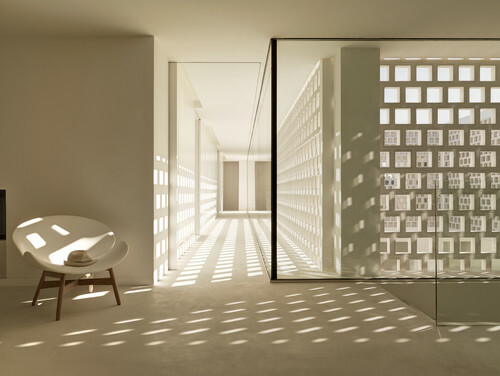 The interior corridors leading to the rooms on the first floor are dotted with geometric shapes, created by the light streaming through the perforated facade. The glass walls with black profiles function as internal walls. The project has a seemingly simple architecture, but, in reality, involves a high level of complexity. The facade collapses to open up the balconies, terraces and porches for the enjoyment of friends and family. aromatic garden, barbecue lounge area, pool, kitchen and entrance hall form a continuum of open spaces at the heart of this property. “Depending on the time of day, how many people are at home, and their moods, you can openly interact with the different options, choosing among leisure, sports, reading, relaxation, cooking and so on,” Wüstemann says. A window along the edge of the pool delivers an amazing view of the mountains, where the afternoon sun sneaks through. The structure consists of pillars and beams, reinforced concrete frames, with post-tensioned beams up to 32ft (10m) on the roof of the first floor to preserve the light coming from the inside patio, with no intermediate support.